Working at my easel I heard a thump and a rustle of papers somewhere behind me. Murphy had finally clawed his way through a box holding drafts–some 700 pages worth–of my great but destined to forever go unread first novel…. The Magic Slate… cardboard shredded, fell apart, pages sliding down the side and between other boxes to the floor. 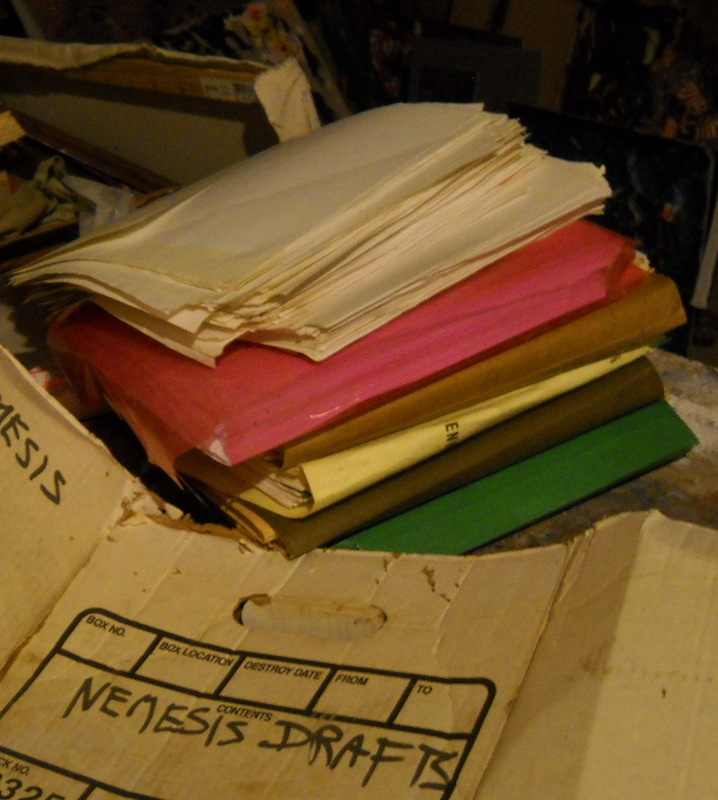 ‘Nemesis’ was its first working title. I wish the photo of #499 were better–I was pretty happy with it. I think I’m finding my way with metal point, my own signature. A couple of painting I’d pulled out and set aside to paint over were rescued by Sire for his room. When I like–or dislike– one of my pieces, it probably hasn’t much to do with it’s actual merit–if such a thing is measurable. What I like isn’t so much the painting, as it is its power to suggest what I want to do next. The pieces I paint over are like closed doors to rooms I’m no longer interested in visiting. Metalpoint seems endlessly fresh, because I’m finding new ways to use it. I’ve got the ground now where I like it. I can get beautifully modulated tones, and almost hear the grit of the silver as it slides over the surface–I detested the plastic-like feel of the unadulterated Golden Silverpoint ground. I use about 1/4 cup of high quality gesso, a heaping TBS of fine marble dust, maybe a teaspoon of water soluble brown ink (with soft Golden Titanium white if the ink makes it darker than slightly off-white–and the rest, Golden ground. Two cups. ‘Nemesis.’ The muse as fatal temptress… that an artist, writer, poet… can achieve the best of their ability only by pressing themselves beyond that… pressing on to an ultimate, and fatal failure. I look at that dusty heap of papers… Fail… fail better.